I was challenged to write a haiku about space on Twitter, by @spacejake_, - and no inspiration came. Some days later I was sitting in the 4th South Australian Space Forum, and a speaker mentioned the afternoon constellation of satellites. A couple of minutes later he said something about data from space, and the first two lines of this poem fell into my head. Afternoon constellation made me think of afternoon tea, sitting at a kitchen table with a cup of tea and the afternoon light falling through the windows. I imagined satellite signals falling unperceived with them, the data lost in milky tea. Signals are no good unless you're listening for them, with the right instrument. It's probably not a technical haiku, just short lines evoking that form, but close enough is good enough as far as I'm concerned. I drew a picture to go with it because that's what I think my space poetry hero, @tychogirl, would have done. The right stuff: how archaeologists come to be. Am I an archaeologist because I'm interested in the stuff? Or am I interested in the stuff because I'm an archaeologist? Which came first? Some time ago, I was talking with the erudite Dr Duncan Wright about how common it was for archaeologists to have been collectors as children. I collected fairly ordinary things - shells, stamps, feathers, and tram tickets, and had hoards of apricot stones stashed in hollows of trees. Nothing more exotic than that. Today, I have a possibly unhealthy interest in lids, pencil cases, tiny spoons, and the fairies-on-sticks that you buy at agricultural and horticultural shows. (There's a whole cabinet at the Pitt Rivers Museum full of tiny tiny spoons for removing ear wax! Oh the splendour! And there is nothing more satisfying than a well-fitting lid, not a screw-top like on a jar, but a tea pot lid, for example). Healthier collecting interests are space things (obviously), icons, fans, gloves and hats, 1960s tea cups and other ceramics, and stone tools. (This feels a bit confessional. Don't judge me). The tactile and aesthetic qualities of things are important. I think I like tiny spoons because of the scale; perhaps this a child's interest in the miniature. Gaston Bachelard has a whole chapter on the miniature in The Poetics of Space. 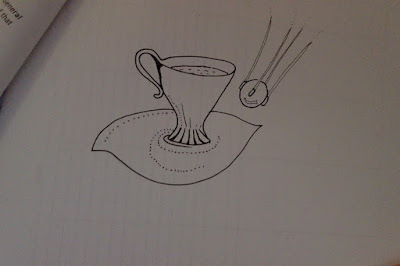 With the 1960s tea cups, it's the asymmetric ones that appeal; they seem subversive and space age-y. And they are lovely to drink from too. Fans and gloves are elegant (Dr Space Junk is all about elegance) and old-fashioned; but they are also bloody useful things to own in hot or cold weather, so I love that they can be both beautiful and functional. The mark of a perfect fan is how silent it is when you use it. Pencil cases partake of that too, and they are of course receptacles for treasured pencil stubs and beautiful pens that are a pleasure to write with. These days I store assorted USB sticks in my pencil case as well. So perhaps I was interested in the stuff first. Perhaps that's why I'm an archaeologist, apart from, as Heather Burke says, being nosy. I guess what I'm getting at here is partially the difference between history and archaeology. Would I be content to just read about places and things? I remember the experience of being at the Centre Spatial Guyanais at Kourou, and my delight and satisfaction at placing my palm flat on the surface of an Ariane 5 rocket booster, leaving an invisible hand print of bacteria and oils. The physicality of things, the materiality, does matter to me. I want to touch them. (The continual temptation of art galleries and museums). In historical archaeology, one of the underlying principles is that the artefacts and places can tell the stories of people who get left out of histories, often the oppressed and poor. So it has a political dimension of giving forgotten people a voice through the material traces they leave behind. It's not just stuff any more; it's stuff that speaks.